Costco is headquartered in the U.S. and is a large retailer operating warehouse club stores around the world. 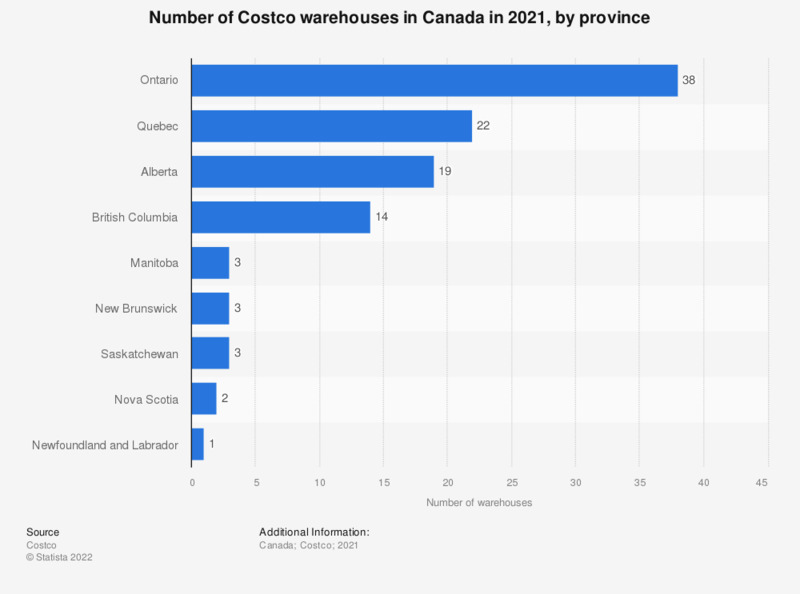 Canada’s most populous province of Ontario was home to 36 Costco warehouses in Canada in 2018, whilst there was just one warehouse in Newfoundland and Labrador. Warehouse clubs offer a more limited range of products than a traditional supermarket and aim to attract shoppers who wish to save money by buying in bulk. Shoppers must become a member and pay a fee to be able to shop in Costco’s warehouses. Almost 95 million people worldwide were Costco members in 2018. There are different tiers of membership, all of which enable members to use any Costco warehouse worldwide and online. Other warehouse club retailers with stores in Canada include Sam’s Club and BJ’s wholesale. Costco offers an online shopping service, which can be a convenient and time-saving shopping option; however, the majority of Canadian consumers still spend more on groceries in-store than online. The main reasons preventing consumers from buying groceries online include a lack of interest and shipping and service costs.